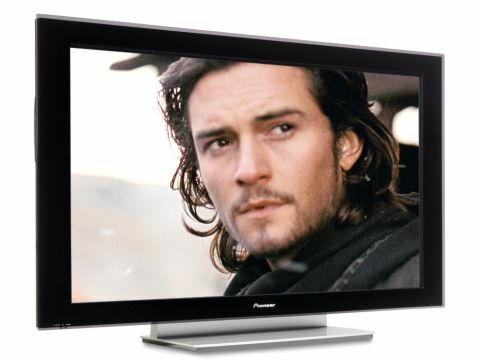 When Pioneer introduces its first UK plasma with a full HD native resolution the viewing public should sit up and look. Quality at a price tends to be the theme with this company's plasma TVs so the arrival of a 1920 x 1080 screen whets the appetite. So it's a nice surprise that as well as the brains it promises, it also slides out of the box looking pretty slinky, with a robust looking chassis too. At this point we wonder at the ingenuity of the hidden speakers until we realise that despite spending £6,000 you don't get any unless you pay for the optional extras. This poor show from the maker of excellent TV speakers is compounded by the lack of a tuner, Scart or component video. What' s going on? 'The future', the company might reply, 'comes with HDMI and DVI sockets attached' as indeed the PDP-5000EX does and all of them can handle 1080p, too. But while this is a screen rather than a TV, it does offer all the construction tricks and processing enhancements that have made the company's '06' plasma TVs so well received. It's also built with a T-Shaped Electrode that's intended to stop individual plasma cells misfiring. Brickbats aside, it's the pictures we're here for and they are among, if not the best we have seen on a 50in TV. Our jaws dropped particularly at the sight of the picture clarity, which seemed almost completely devoid of noise. The high resolution offers a level of detail that outdoes Pioneer's highly regarded 768 line plasmas. The lack of sparkle on the crusaders' armour in Kingdom of Heaven was highlighted as well as the failure of the soldiers' capes to achieve that elusive bluey-whiteness. Colours dazzle richly and black levels impress with their depth and shading. Happily, the SD performance was almost as impressive even when upscaled to 1080 lines.